summary: - Attempt to delete the last trash segment in a dungeon run if this trash is the current segment. I'll delete it and pass the last boss segment as the current segment, after that it'll create the overall segment for the dungeon run. summary: - Tagging deprecated functions as 'deprecated' and small cleanups. summary: - Make sure the actor isn't a fight component before the garbage collector erases it. summary: - Fixed debug message without debug enabled. summary: - Garbage collector won't clear actors in mythic dungeon segments. summary: - Segments list improvements. summary: - Changed the way mythic dungeons are handled internally. summary: - Fixing the Streamer plugin for the recently changes in details!. summary: - Fixed Raid Check plugin not showing the in plugin management nor in the title bar. summary: - Fixed plugins initialization broken in latest version. summary: - Attempt to fix some plugins loading after details! start and failing to install. summary: - Moving Details:Start() to PLAYER_LOGIN. summary: - Fixed an issue where some options combinations was making the window unlock after /reload. summary: - Custom display 'My Spells' now get the player role from the current spec the character is using. summary: - Added encounter ID for Grong horde version inside the parser encounter rules. summary: - Fixed Player Details Breakdown window not opening for new instalations. summary: - Fixed Player Details! Breakdown window not opening for new installs. summary: - Major clean up on plugins that lost support on 8.0.
summary: - Encounter updates and framework fixes. summary: - Framework update for mage polymorph fixes. summary: - Improvements on the Encounter Breakdown plugin. summary: - Battle for Dazaralor update. summary: - Fixed Event Tracker tool broken on 8.1 patch. summary: - ToC and libraries update. summary: - Fixed East Asian myriads showing a giganting non formated number in the total bar DPS. summary: - Framwork update for timeline plugin. 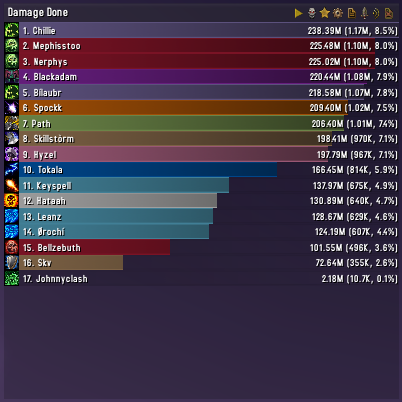 summary: - Added Death Logs for mythic dungeon runs in the Overall Data. summary: - Fixed window for report to Copy/Paste. summary: - New Feature: import and export profiles. summary: - Major improvements on row text scripts, now they pass 4 objects: actor, combat, instance and the default text of the bar. summary: - Added import and export profiles. summary: - Fixed broken change log from last version. summary: - Fixed damage on low level training dummies where it was showing 1 damage for each ability. summary: - Fixing the pvp issue introduced in the previous build. summary: - Send character data when the group roster changes. summary: - Player detail window now has bigger lines (16 pixels to 20). summary: - Added a macro section with useful macros. summary: - Updated to BFA 'Potion Used' and 'Health Potion and Stone' custom displays. summary: - Show light of the martyr damage on death log. summary: - Deprecated rules for friendly fire has been removed, this might fix some random issues with mind controlled players in the Lord Stormsong encounter in the Shrine of the Storm dungeon. summary: - Fixed pets with the owner name showing twice in the pet name. summary: - Added macro text box in Encounter Plugin. summary: - Added a new panel to open the Chart after a mythic dungeon. summary: - Details! is ready for Uldir mythic raiding!. summary: - Removed RaiderIO integration. summary: - Fixed custom display 'Dynamic Overall Data'. summary: - Fixed spell container :ListActors() API. summary: - Cleanup on the item level tracker. summary: - Workaround for Hunter's Incendiary Ammunition bug. summary: - Fixed the latest raid check update. summary: - Updated flask and food list to BFA.